Commonly referred to as a wheel play. This a basic man up play run by high level teams. You see a lot at the collegiate level. the reason you see it more with higher level teams is because it takes everybody on offense to be synchronized at the same time. It may seem easy to do, but at the younger levels the timing may be off and a player who is not paying attention can ruin the whole thing. At the younger levels it is easier to do plays that are not reliant on everybody doing the correct thing at the same time. What is more is that even if everybody is moving in the correct spots all the players must be able to make the correct looks. 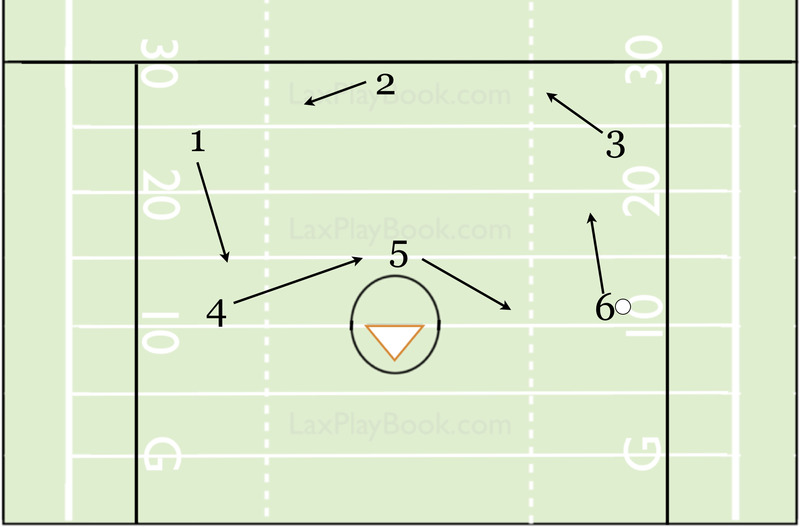 The basic premise is to pull a defender out of there zone, making the rotation awkward. A defender who is in front of the offensive player must follow that player if he carries that ball into the soft part of the zone. A new offensive player will fill into that spot the ball carrier came from forcing a new defender to pick up that guy. This has now pulled the zone out of place. Hopefully the ball carrier knows where to send the ball if the offense is successful in forcing the defense to move out of there designated spots.